Awards using art glass components are excellent options for a wide variety of occasions and events: speaker gifts, retirement gifts, top sales producers, employee of the year, sponsor gifts, and first place awards, to name a few. Because each art glass piece is hand blown, artists can add a wide variety colors that can be achieved in standard glass and crystal awards. Vivid blues, deep greens, vibrant reds, stunning yellows, luminescent purples, and bright oranges are drawn through the molten glass to create beautiful arrays of color. With hand blown glass, the artists can also achieve a wide variety of unique shapes: twists, swirls, and droplets, as well as more traditional vase and bowl shapes. 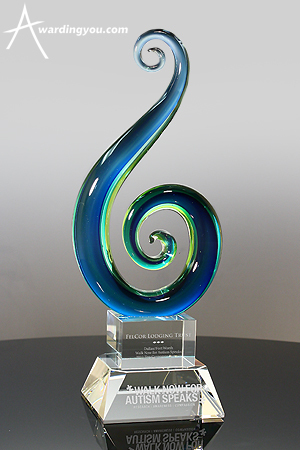 Awarding You combines the art glass components with one or two base components, to provide adequate room for engraving a company logo, recipient name, date and award name. These awards often come in various sizes, which provides a great option when you need a family of awards for a program. From 7"-20" tall, there are many options to chose from.